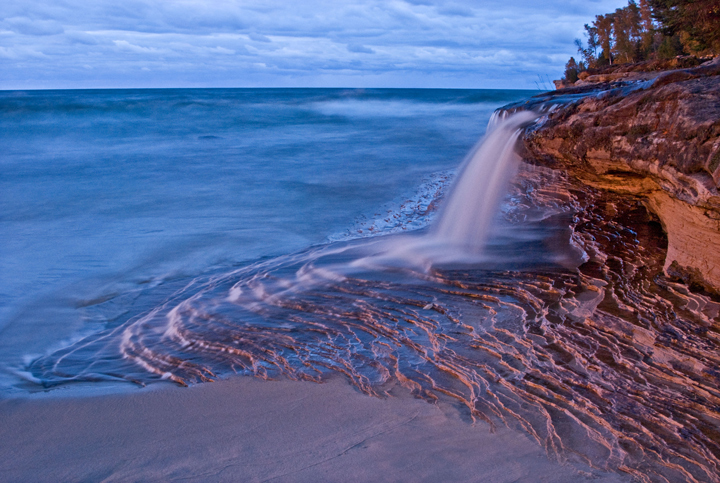 One of my favorite locations in Michigan’s Upper Peninsula is Pictured Rocks National Lakeshore. 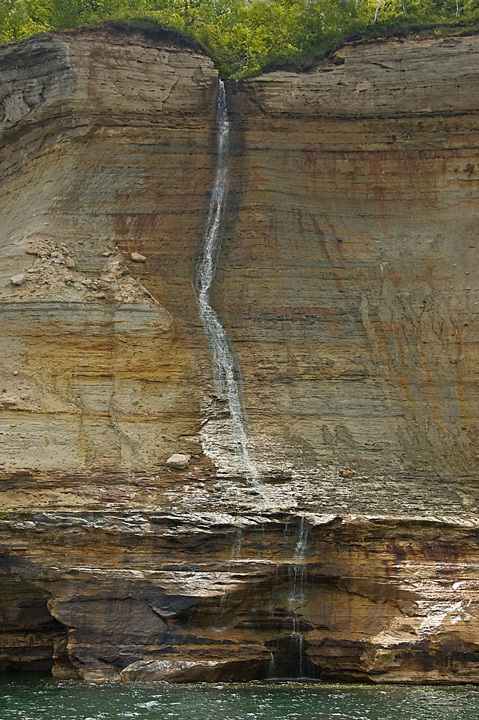 Pictured Rocks has a number of beautiful waterfalls which I try to visit each time I travel to the park. 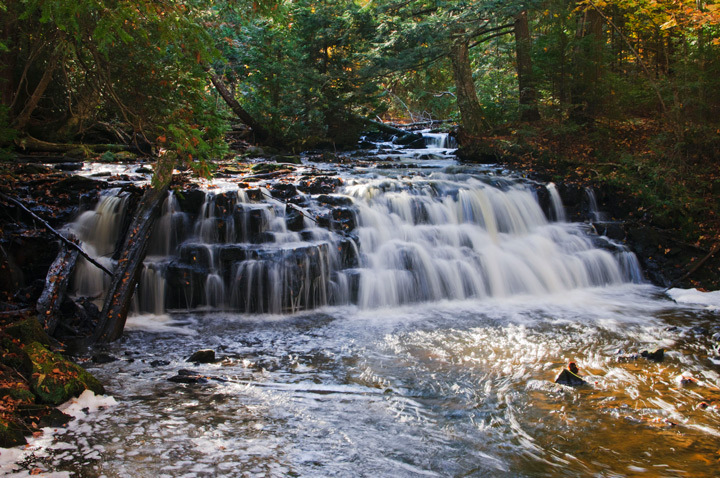 Munising Falls is actually located in Munising, Michigan although it is part of the Pictured Rocks National Lakeshore. This photo was taken in the fall as the leaves were turning in the fall. I’ve visited the falls on a number of occasions. The thing that I remember the most were the mosquitoes. One time they were so bad that I encountered several screaming people running from the viewing area. They forgot to put on the bug repellent. Miners Falls is located off the road to the Miners Beach area. The waterfall itself is impressive dropping 50 feet. While the falls is impressive what I like is the hike into the falls. It’s only about a half mile hike but in the spring the floor of the forest is carpeted with wildflowers and in the fall it is carpeted with leaves. It does require that you walk down seventy plus steps to the viewing Platform. Elliot Creek Falls, I’m not sure this is the correct name, this falls is not mentioned in any of the park literature but it is one of the most photographed falls in the park. It is located on the east end of Miners Beach. It is only about 4 feet high but offers some spectacular photos in the late evening light. I typically make it an evening and try to get some sunset photos at the same time. This can be a popular spot so you may need to lineup to get a shot. Bridalveil Falls is a seasonal waterfall that usually dries up in the summer. It is best viewed from the water and cannot be seen from the North Country Trail. This photo was taken on the boat cruise in the middle of June and as you can see there was not much water in the falls at that time. 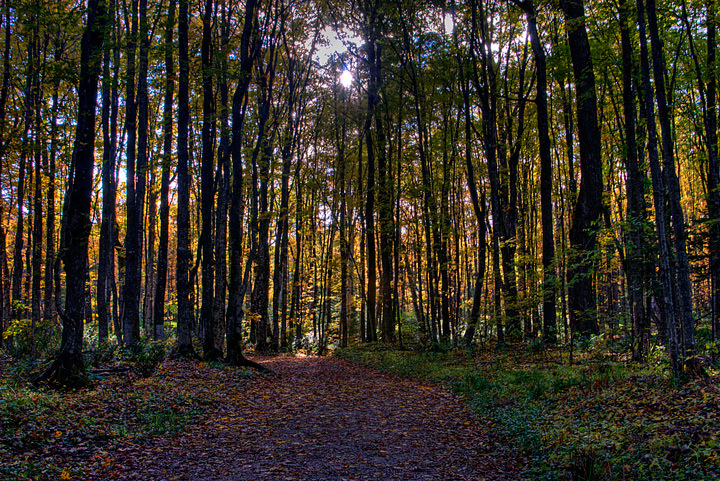 The trail to Mosquito Falls starts at the parking lot at the end of Chapel Road. I usually combine the trip to Mosquito Falls with a visit Chapel Falls and hike the ten mile loop trail that goes from the parking lot to Chapel Beach then over to Mosquito Beach then back to the parking lot. You can also just hike to the falls on the Mosquito Beach trail. Mosquito Falls is my least favorite waterfall in the park. It less than a ten foot drop and I’ve had problems arriving at the falls when the light is good. This is another waterfall trail that is spectacular in the spring when the ground is carpeted with wildflowers. The trail to Chapel Falls starts at the parking lot at the end of Chapel Road. As noted above I normally combine my hike to Chapel Falls with a loop hike that also takes in Mosquito Falls. 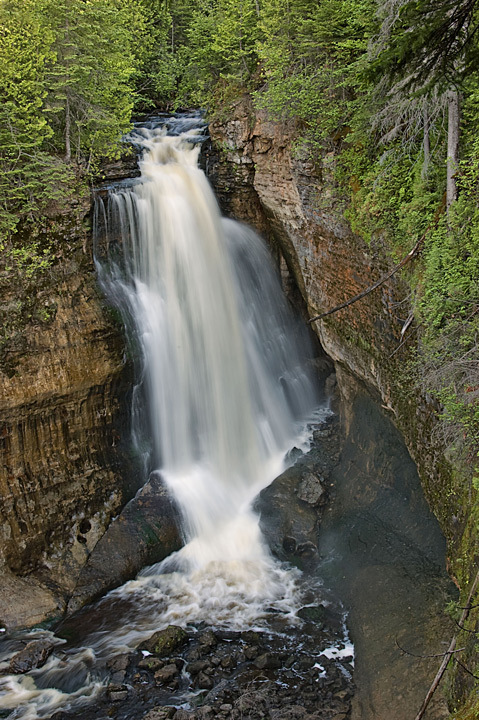 Chapel Falls drops 60 feet over a limestone cliff. There are several viewing platforms along the trail. This is another waterfall that is difficult to photograph if the sun is shining. It is also difficult to get a complete view of the falls from the viewing areas. This photo was taken at the top of the falls just before it drops over the cliff. This is another hike that is spectacular in the spring with the wildflowers and in the fall with the leaves. 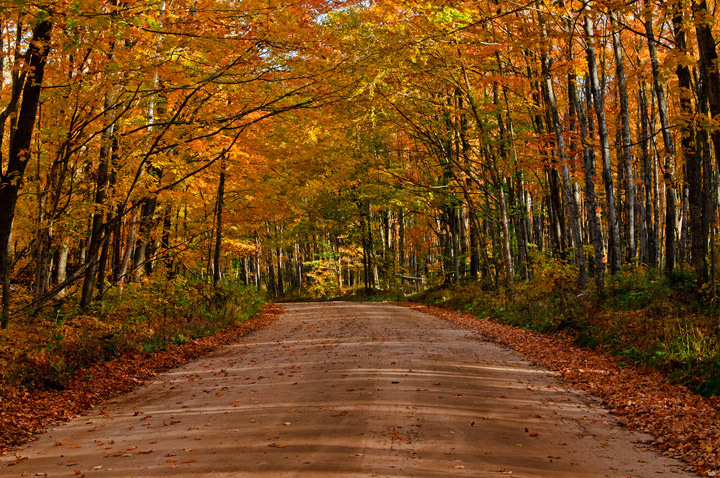 The drive in to the Chapel Road parking lot is also spectacular in the fall. 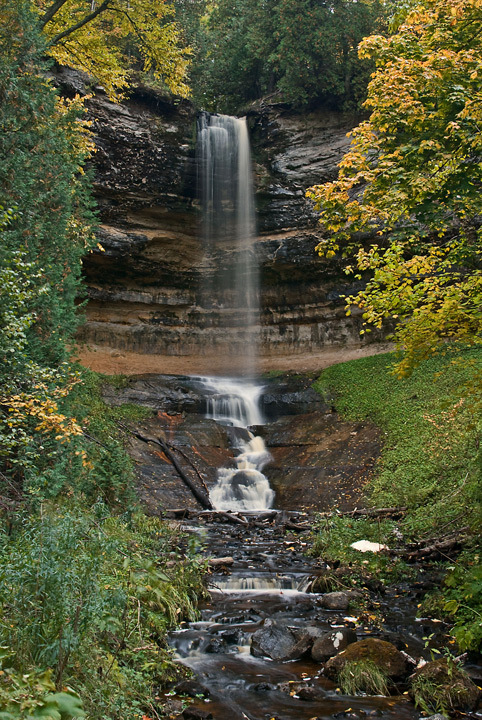 Spray Falls can be viewed from the North Country Trail or from the lake. I usually try and combine the trip to spray falls with a trip into Chapel Beach. If you hike about 1.75 miles east from Chapel Beach you will reach Spray falls. Little of the falls can be seen from the trail at the top of the falls but if you continue on past the falls for several hundred yards you will find a nice rock viewing platform. The shipwreck Superior lies below the falls. There are some nice views of rocks in the lake and the shipwreck from the viewing platform. 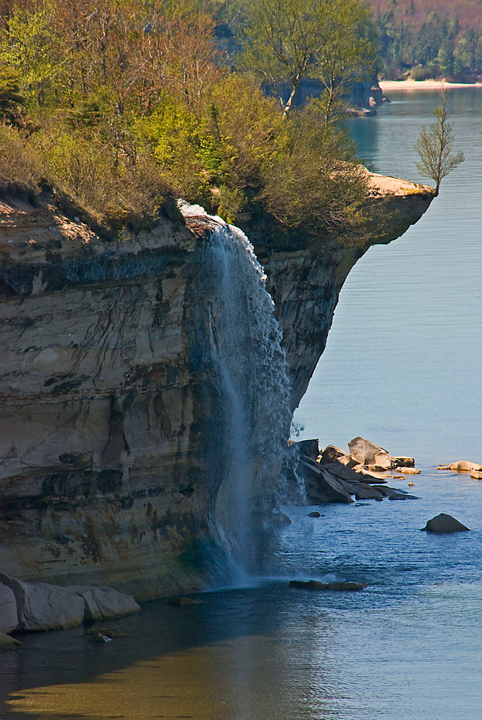 The falls drops about 70 feet over the sandstone cliffs directly into Lake Superior. If you take the boat cruise you need to make sure you are on the right cruise since only one trip per day goes to the falls. This is another waterfall where the water levels may vary so it is worth checking with the park serviced before making the trip. 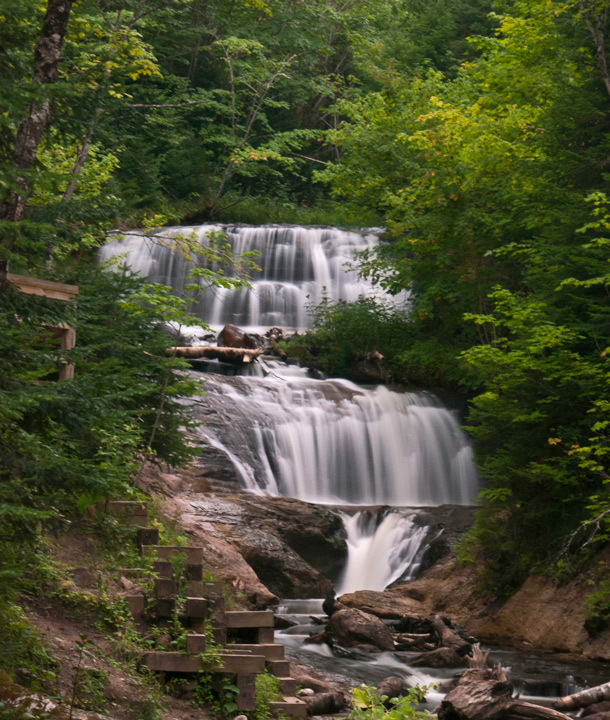 Sable Falls is located on the east side of the park just outside Grand Marais. 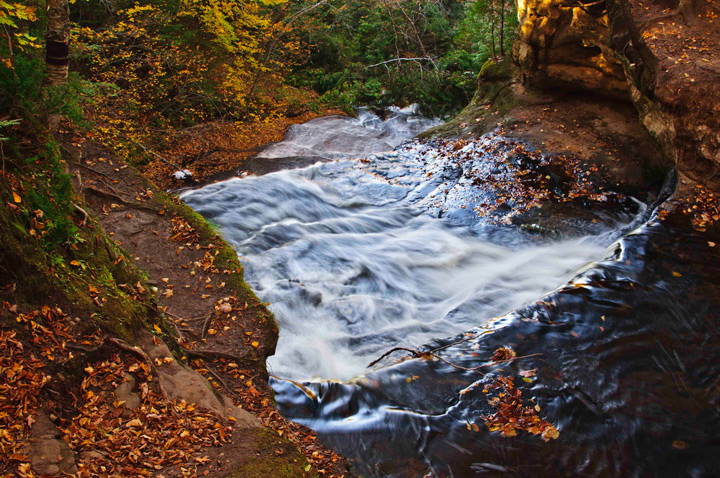 The hike to the falls is short but it does require that you walk down 169 steps to the viewing platforms. Unfortunately the viewing platforms are not well placed so it is difficult to get a clear photo of the falls. One time when I was there someone climbed over the barrier so he could get a better shot of the falls. Several others were standing in the rain waiting for him to get out of the way. There were several rangers in the area and they quickly made him leave.